Ok, folks, this is what you would hear at lunch time if you pass by Aparthotel Lucky Bansko from June to August. It has been my 6th year with Lucky Kids International Language Camp, and believe me, it is getting better and better as we grow through our experience, just like our kids are growing their confidence in using English with every activity they take part in. So, where are we heading today? Is it the Horse base? Or, maybe Paintball? Hiking? Well, as a part of our program, deliberately built to meet the individual needs of each of our campers, we have some outside time every day. We take advantage of the incredible nature around not only to encourage active life among our Lucky kids but also to enrich their words arsenal by exposing them into multiple and varied activities in the outside. Not surprisingly, it is much easier, not to mention entertaining and engaging, to learn new words in action. Both visual memory and cognitive abilities are optimised, which leads to instant and long-lasting results. Memorising lists of vocabulary can be challenging, not to mention potentially dull. Here in Lucky Kids English Camp, we believe that association is key to retaining new words. A great way to build vocabulary is to make sure the lists our kids are learning come from situations or texts that they have experienced themselves, in a nutshell, the content is always relevant and connects to background experience. Any form of education can be quite monoton when you approach learning through repetitive rote learning methods. This creates a poor learning pattern, which will usually lead to smaller amounts of progress. This is, unfortunately, a great percent of nowadays’ education approaches, and this is what we are trying to avoid happening during our program. We do not deny the benefits of conventional teaching, but we aim for optimal use of it while implementing new, modern and stimulating the learning process methods. To play competitive and exciting games. In order for them to take part they must be able to understand and communicate in the target language. 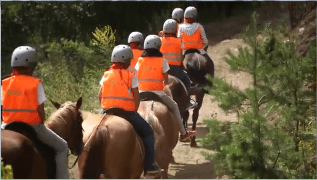 Here, that is why we, the team of Lucky Kids Camp, encourage and take part in spending great time with our campers in the mountain, in the farm, in the horse base, cycling, practising yoga, swimming and even cooking. All those activities are our best and most valued tools to build sound knowledge in any aspect during our time. In addition, we do not only use the outside time to develop richer vocabulary in English but also to demonstrate and practise our camp virtues such as friendship, humanity, respect, diligence, persistence and love for what we do. Our kids are everything to us. It is not just a camp in the conventional sense of the word. We are family! For two weeks we are eating together, playing and learning together, making friends, overcoming challenges and all that in English. Furthermore, besides our outside activities we have developed a solid program in the evening in order to maximise the English speaking opportunities in various aspects. We have talent shows and pillow fights, team building and race evenings, treasure hunting and detective`s night, and, even, wait for it, movie night enjoying popcorns and fresh orange juice while cosy lying down in our pyjamas. In other words, we have taken the best from the old-fashioned teaching techniques and have created our own system based on valid knowledge and creativity. There is a common misconception that proper learning should be serious and solemn in nature, and if one is having fun then they are not truly learning. Games provide an alternative route to learning a language while providing a pleasurable method to do so. That is why here in Lucky Kids we use the game both outside and inside the classroom. It instead means acquiring the skills necessary to be able to respond appropriately in another language, when under pressure in various circumstances. Games can help deliver these benefits in the most entertaining way. Therefore as our campers delight in playing a game, they can enjoy themselves while unconsciously acquiring an array of language skills! The use of games can be a fantastic learning tool to advance in any language. In this approach, our kids are already winning in the game by learning more of the target language, or the language needed for taking part in the specific activity. Well, it is pretty great I must say! Learning bonded to emotions and the excitement of the experienced is solid and undoubtedly for life. Play has many forms under its umbrella, including fantasy, story telling, music, movement, games, etc. Play almost always promotes excitement, enjoyment, and a relaxing atmosphere. That is why it is our most powerful weapon both in the classroom and outside. Our most sacred mission in LuckyKids is the wellbeing of our campers which includes not only developing their English language skills but also contributing to enriching their personality, and revealing their inner potential as much as possible. In order to achieve this, we aim creating friendly-like atmosphere with clear, however, boundaries between teachers and pupils which we find vital. All our activities and games are targeting different components of a successful and internalised learning of the Language. This involves revising, consolidating and expanding the existing knowledge on the one hand, and, unlocking the vast opportunities for growing emotional awareness, self-awareness, motivation, self-regulation, empathy and adeptness within our kids. It is, of course, important for good communication with others – and is therefore a gateway to better learning, friendships, academic success and employment. Skills such as these developed in our formative years at school often provide the foundation for future habits later on in life. Proper language and personality development techniques require that teachers also adapt materials to enable learners to find out about each other’s interests, habits, preferences and characters, both to stimulate discussion and to strengthen intra-group relationships. We are creating a bond between our kids,we are encouraging their fellowship and later we rely on this bond to grow their English language base. In other words, games and activities in LuckyKids are far beyond random. Their deliberately constructed and followed to create a sequence which final goal is to nourish both the language skills, and emotional and social intelligence; and this we do in and out of the classroom. We at LuckyKids have the clear understanding that our campers are all different individuals with different interests, needs and experiences. Moreover, we have campers from different countries and cultures. That might be quite challenging at times. What is our approach? Separate them by countries? No, not at all! As I have already previously mentioned, we firmly stick to our virtues, and friendship is the one that makes us distinguish. We encourage cultural exchange and diversity. We built activities and games to promote friendly environment that uses English as means of communication. Let’s be honest, there is not a single kid that would not enjoy playing, or racing, or just trying something new. We overcome fears and break hinders and there is nothing like teaching a kid ride a bicycle or making cookies. We do that together! We learn, we practise, we grow! Of course, we have to face the fact that some kids are shy, or timid, or insecure. We do not push them! We give them the time but let them know that we are together and by their side. During our evening activities we find some kids less active, or said in a better way, less confident to take part but with an obvious desire to do so. What do we do in such cases? Well, we team up! Counselors and teachers team up with campers and play together no matter whether it is the talent show, pillow fight or karaoke night. We do not expect that all kids will be equally adjusted to social interaction but we do make sure that they make the most of it during our time in the camp. To summarise, here in Lucky Kids Camp we support and encourage diverse teaching approaches where fun and education go hand by hand. That is for us a natural way of learning which exposes students to real learning opportunities. Our aim is to encourage, entertain, teach, and promote safe educational environment which helps our kids to see beauty in a foreign language and not just problems that at times seem overwhelming. We promote more than education, but solid knowledge gained through the individual and unique experience of each of our campers.